The performance career of Alex Meixner (M.M. '01) began at age 6 with his two sisters and father in an ethnic folk ensemble. 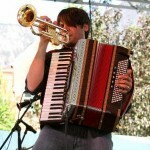 From these early experiences to headlining appearances at music festivals throughout the United States, and concert performances with the London Symphony Orchestra, Sandy Duncan, and his own jazz and ethnic ensembles, Alex has developed a unique musical mix that appeals to a wide cross-section of audiences. To date, he can be heard on over 50 recordings. His formative musical studies were on piano and piano accordion, but he quickly branched out on drums, diatonic button accordion, bass, and trumpet, his major instrument at Penn State. This instrumental versatility is combined with a musical background that has included intense studies and performance of jazz, classical, pop, polkas, and many ethnic folk music genres with some of the leading artists in the world. His talents in music and comedy were featured on the Tonight Show on NBC in 2004. His “Polka Freak Out” CD with Bubba Hernandez garnered a Grammy nomination in 2007. Currently based in Palm City, FL, Alex performs as a solo artist as well as with numerous touring ensembles. His solo programs- “Fascinating Rhythms of the World” focus on the fusion of Slavic folk music and jazz, but also include the inflections of folk, pop and classical styles from Latin America, Africa, and other sections of Europe. This music serves as the basis for a series of multi-cultural music education seminars and performances currently available through the Pennsylvania Council on the Arts “Artists in Education” program. Alex also leads The Alex Meixner Band in performances throughout North America. Appearances in summer 2013 include venues in Pennsylvania, Rhode Island, New York, and Minnesota.